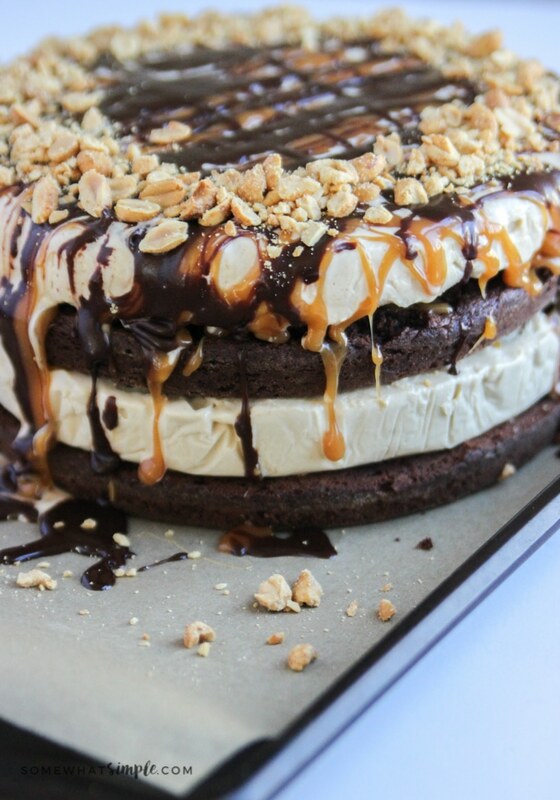 This homemade snickers ice cream cake recipe is layered with silky peanut butter ice cream, fudgy brownie, homemade salted caramel and fudge, and topped with peanuts – a winning combination for any celebration! Promise me one thing right now. Okay, ready? You must make this ice cream! 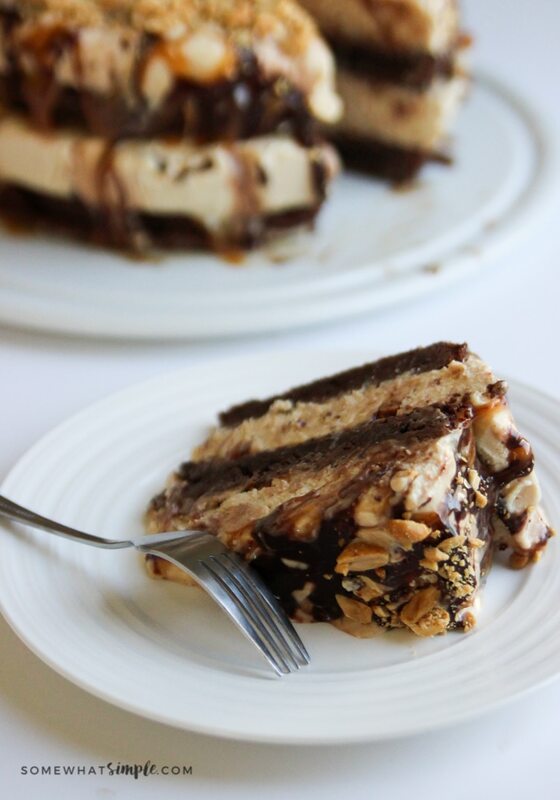 It’s so easy, so delicious, and lends itself perfectly to a decadent homemade snickers ice cream cake! First gather and measure all your ingredients. 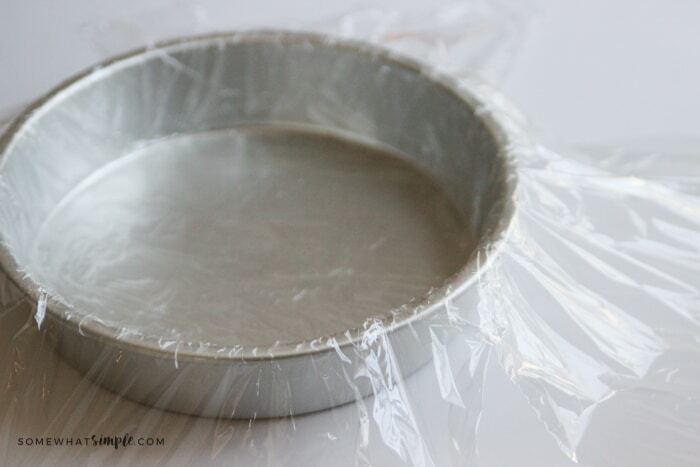 Line a 9 inch round baking pan with plastic wrap. Blend your ice cream ingredients together in the blender, chill, and toss into your ice cream maker. When the ice cream has reached a soft serve stage spread it into your pan, cover it with plastic wrap, and place it in the freezer to harden. When you are ready to assemble, gather your brownies, ice cream, salted caramel, fudge and chopped peanuts. 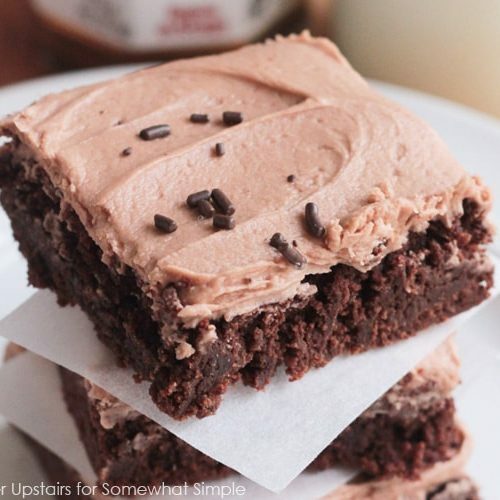 Begin with your brownie layer and drizzle with fudge, salted caramel, and peanuts then top it with ice cream. 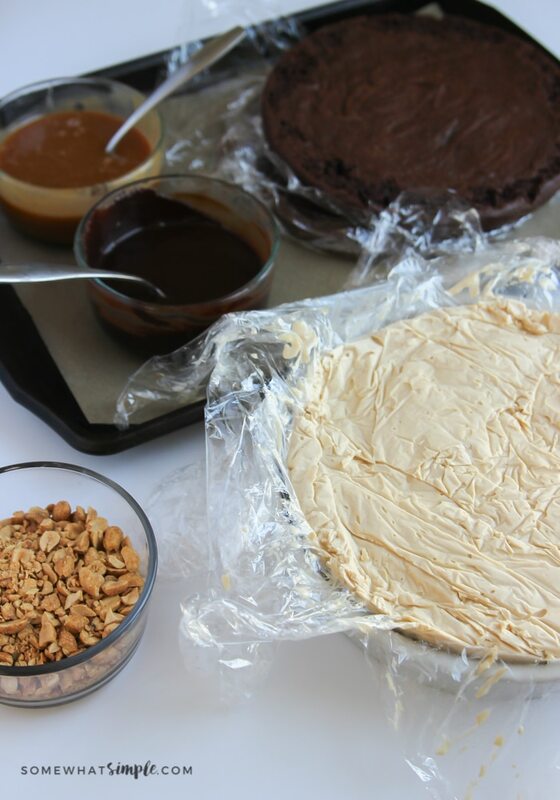 Continue layering with fudge, salted caramel, and peanuts between each layer. On the final layer I like to be a little more generous with my toppings allowing them to drip over the sides. Because guys — salted caramel is my love language! 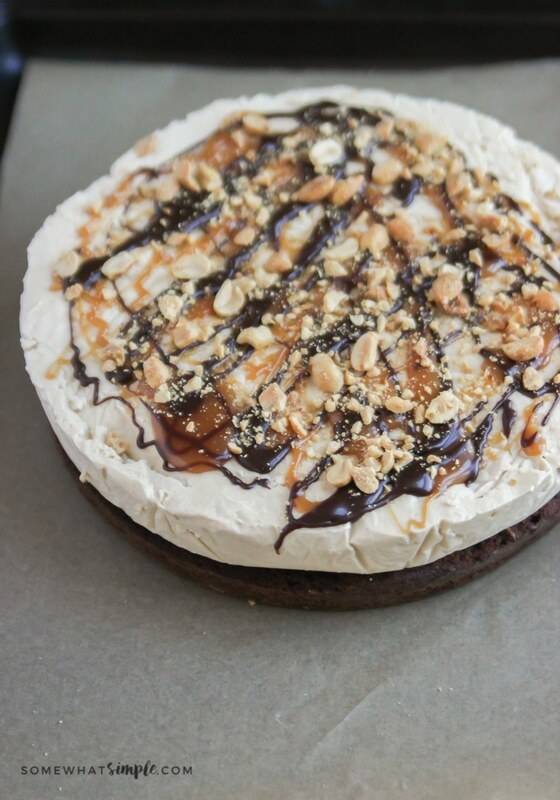 Place your completed snickers ice cream cake in the freezer until you are ready to serve. Allow the cake to sit at room temperature for a few minutes before slicing and then eat to your heart’s content! 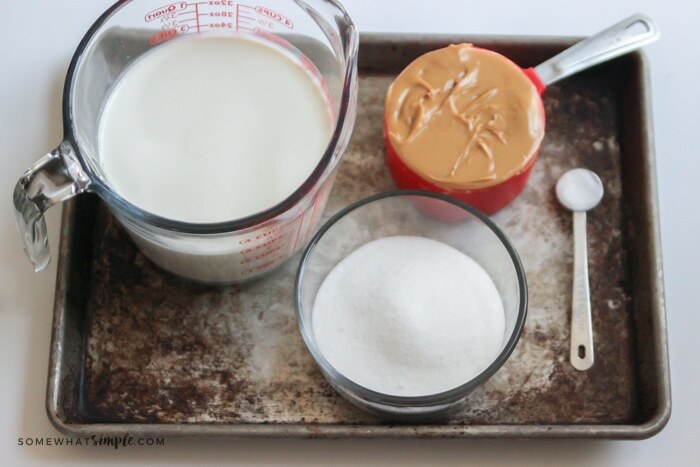 Begin by measuring out the half and half, peanut butter, sugar, salt, and vanilla. Blend until smooth and then place the liquid in an air-tight container and chill for 2-3 hours. Next gather the necessary equipment for your ice cream machine. Churn until your ice cream has reached a soft serve stage, or according to the manufacture’s directions. 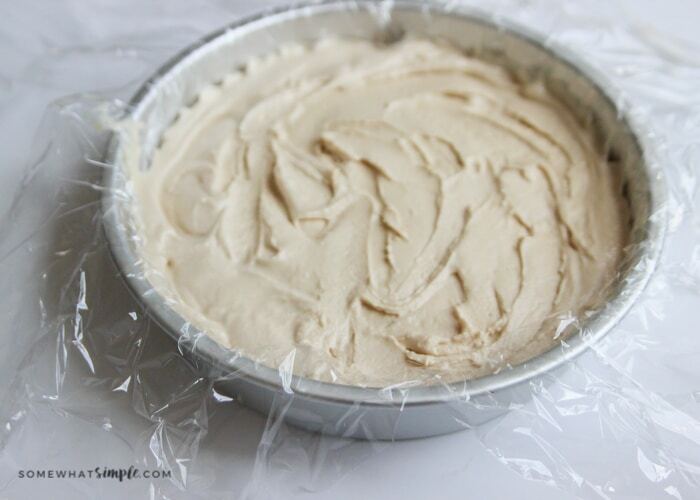 Line a 9 inch round pan with plastic food wrap, leaving enough overhang to tightly wrap over top. Place your ice cream in the prepared pan, cover and freeze. Before assembling make sure your ice cream is fully frozen, and your brownie base is completely cooled. If you have made your salted caramel and fudge ahead of time, warm them until they are just pourable*. To assemble begin with your brownie base and drizzle with salted caramel, fudge, and top with chopped peanuts. Top with your ice cream layer and repeat. Continue until your have reached your top layer and decorate as desired. Place your completed ice cream cake in the freezer. 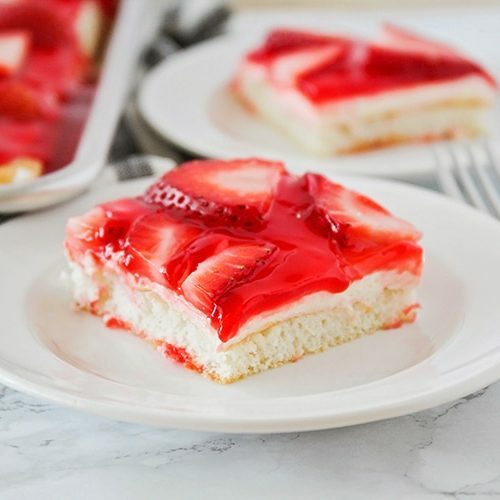 When you are ready to serve, allow the cake to sit at room temperature for a few minutes and then carefully slice with a sharp knife and enjoy! The recipe above will yield 1 nine inch ice cream layer and 1 nine inch brownie layer. To make a four layer ice cream cake as pictured you will need to double both the ice cream and the brownie recipes. 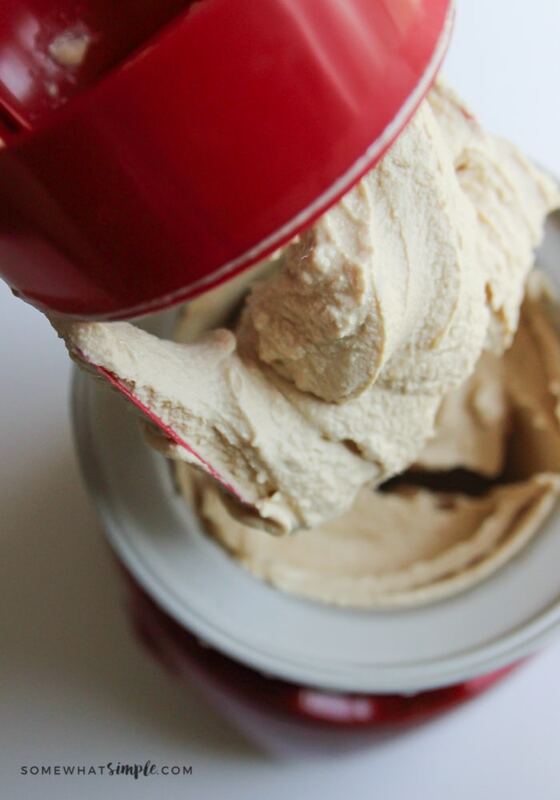 Depending on the size of your ice cream machine, you may have to do this in two batches. When making this cake here is the timeline I like to follow: 3 days before assembly – make the first ice cream layer and the hot fudge. Store the fudge in an air-tight container in the fridge. 2 days before assembly – make the second ice cream layer and salted caramel. Store the caramel in an air-tight container in the fridge. 1 day before assembly or day of assembly – bake the brownie layers, cool, and wrap in plastic wrap until ready to assemble. If you have made your caramel and fudge ahead of time, I recommend warming them to a pourable state to make assembly easier. To make sure they are not too hot, test the temperature. Aim for room temperature – To the touch both the fudge and the caramel should feel neither warm nor cold. 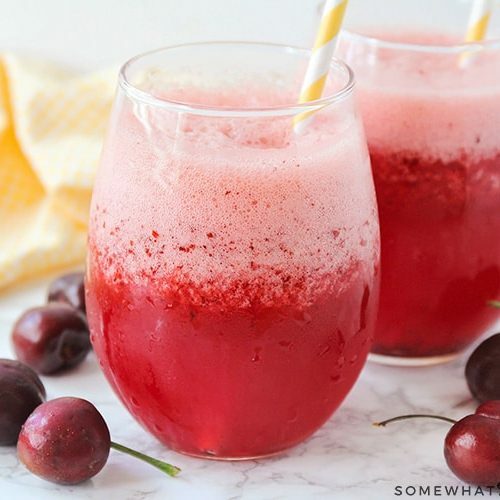 Check out the posts below for more delicious summer treats! Hey, Stephanie! 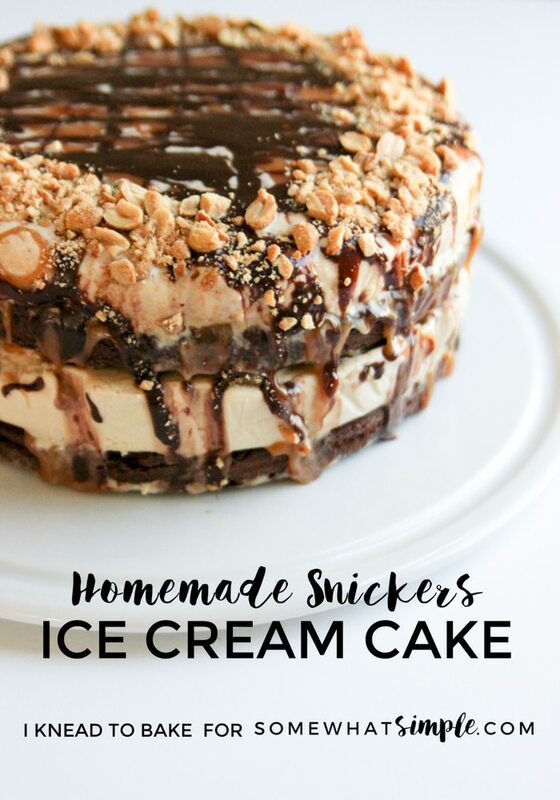 Just wanted to let you know that we loved your Homemade Snickers Ice Cream Cake Recipe so much when you shared it at the #HomeMattersParty last week, we’ve FEATURED it THIS WEEK! Hope you can check it out when you get a sec. Happy Friday!!! Such yummy gooey goodness! Thanks for sharing with SYC.